Greyt Fun for a Greyt Cause! Hundreds of people turned out for GALT's "Holidays for the Hounds" event over the last two weekends. Santa was a real trouper, posing for pictures with humans and canines for five or six hours on all four days. We had a nice mixture of greys, whippets, iggies and a number of other breeds -- no doggie discrimination for this event! Delicious refreshments were provided by Stern's Catering and Dallas Addison Catering -- complemented nicely by some home-baked goodies from several GALT volunteers. In addition, doggie treats were donated by Rain Dog Treats. The 2011 GALT calendar, new Christmas card designs, and GALT 10th Anniversary t-shirts and sweatshirts were unveiled, to the delight of our Christmas GreytStore shoppers. To raise additional funds, we raffled off ten items each weekend, including some fabulous jewelry, artwork and other prizes. Congratulations to Donna Johnson, the winning bidder for our silent auction item -- a stunning hand-made doll house created by Sara Yetter. Many thanks to our wonderful volunteers who helped make the event such a success. We raised significant funds for the hounds, and had a greyt deal of fun in the process. This was also a terrific networking event for current and potential new GALT members, adopters and fosters. 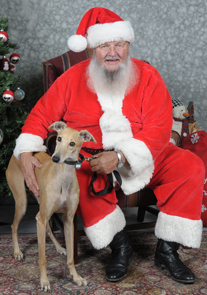 Finally, thanks to all of you who supported GALT by purchasing Santa pictures, Greytstore items and raffle tickets. The hounds say "Thank Roo" -- and happy holidays!